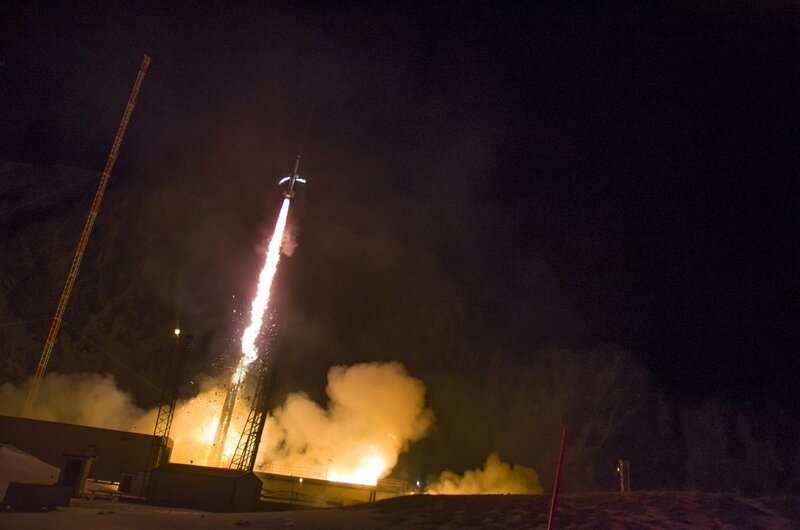 NASA Sounding Rockets Program Office and ASC launched two sounding rockets in the AZURE project tonight at 2214 UTC. The two vehicles were launched two minutes apart, reaching 320 km altitude while releasing a visible gas to investigate conditions inside the aurora borealis. Nei, vi blir ikke invadert fra rommet. Det var bare rakettoppskyting fra Andøya Space Center. De som trodde aliens var på tur inn for landing, kan bli glade eller skuffet. Konspirasjonsteoretikere kan forsåvidt slutte å lese her, men ifølge offisielle kilder, var kveldens lysshow på himmelen spor etter rakettoppskyting på Andøya Space Center. – Andøya Space Center har skutt opp noen raketter. Dette har vært godt synlig på himmelen. Politiet har mottatt mange meldinger vedrørende observasjonene, opplyser politiet på Twitter. Fotograf Øystein Lunde Ingvaldsen i Bø, festet fenomenet på video. Han, som mange andre, lurte på hva i himmelens navn fenomenet var. Ikke lenge etter gikk politiet ut med info om hva som var årsaken til lysshowet. På grunn av et noe, vel, fargerikt språk av fotografen har vi i samsvar med Lunde Ingvaldsen valgt å publisere videoen uten lyd. The spectacular AZURE experiment is the latest of several missions probing the interface of Earth and space over the Arctic. 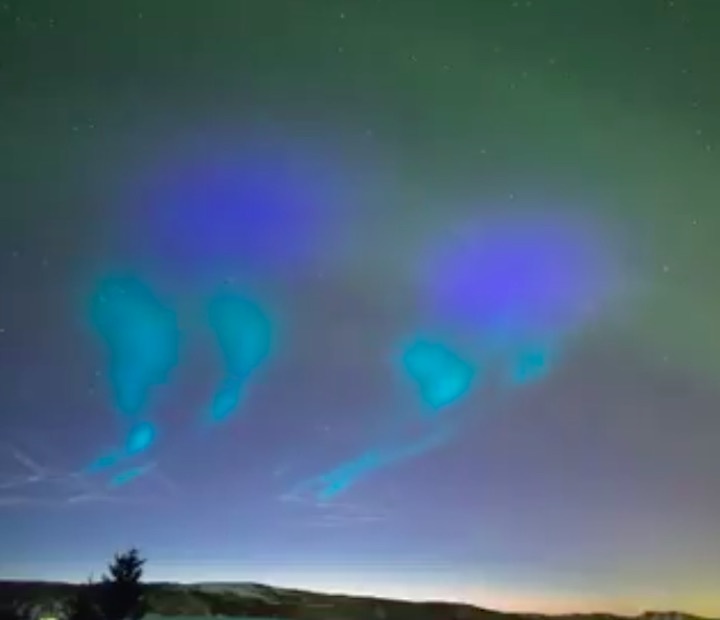 The April 5th AZURE launch released ampules of chemicals, creating patterns of colors in the night sky. Just. Wow. What would you think if you were suddenly confronted with this sky scene? 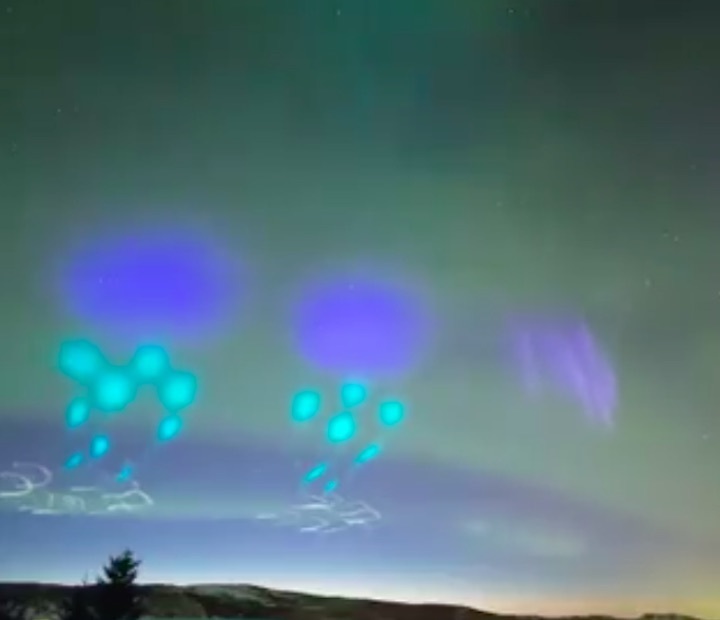 Residents of northern Norway were witness to just such an amazing sky spectacle recently on the evening of April 5th. 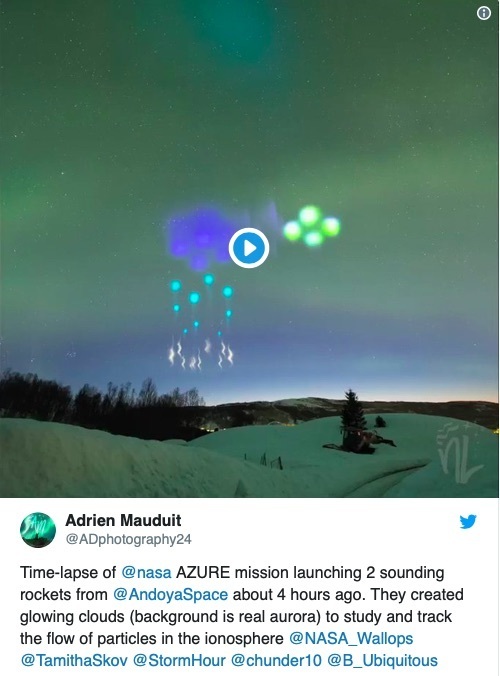 The launch was part of NASA's Auroral Zone Upwelling Rocket Experiment (AZURE) to study energy exchange during auroral activity. 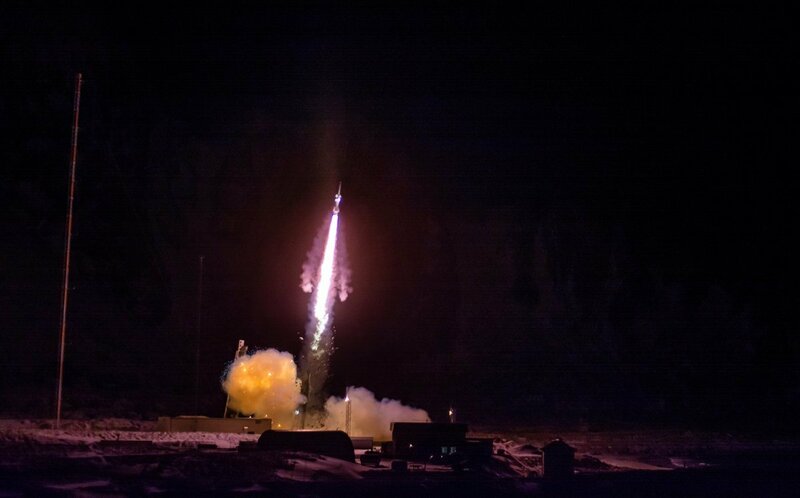 Two sounding rockets released ampules of chemicals that swirled and dissipated hundreds of miles above the ground, showing scientists the density and temperature of the atmosphere at high altitudes. 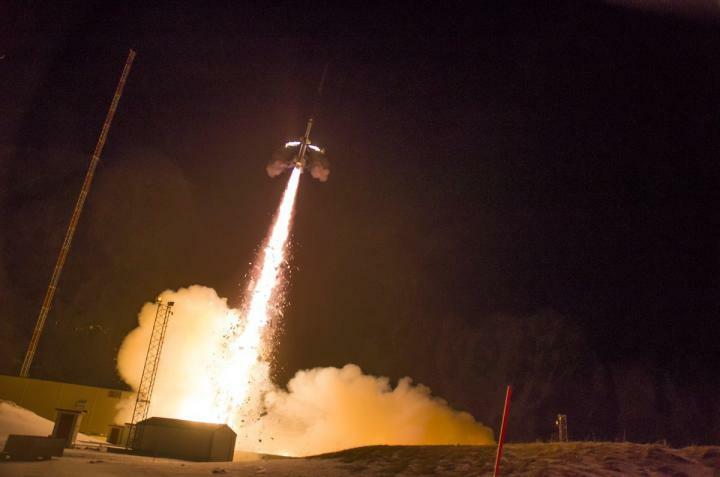 The launch was also part of a larger scientific campaign spanning 2018 and 2019 to study the interactions between Earth and space using suborbital rocket launches from the Andøya Space Center and the Svalbard Rocket Range. Two Black Brant sounding rockets launched from Andøya at 22:14 and 22:16 Universal Time (UT). The launch was scrubbed on several dates previous, as the sky conditions had to be near perfect for ground stations to observe and track the gas tracers. 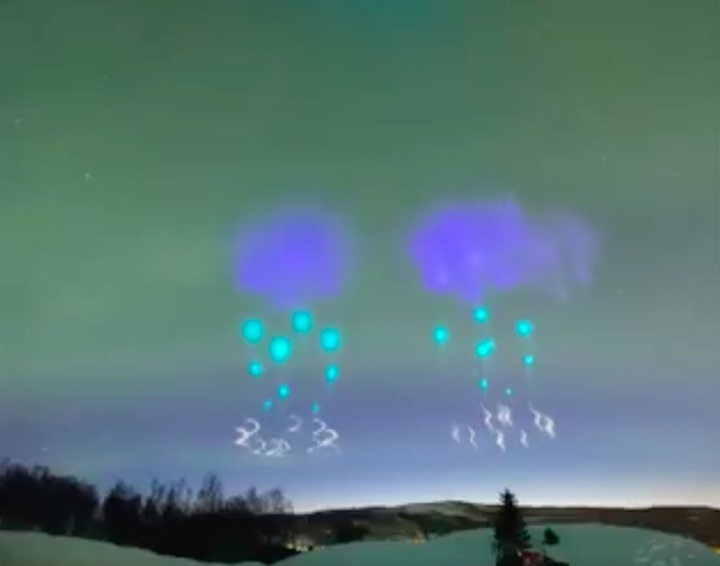 AZURE lift-off 2019 from Andøya Space Center on Vimeo. 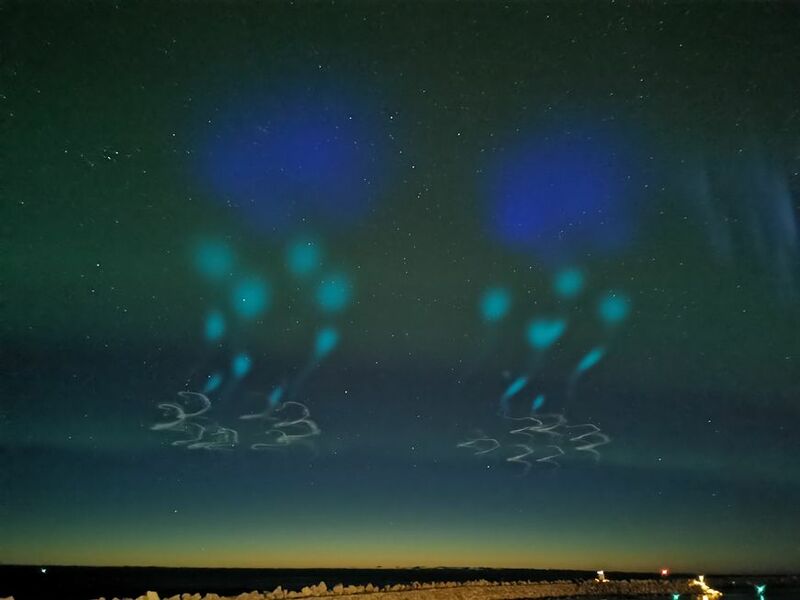 The trimethyl aluminum and barium-strontium tracers were released shortly after launch at an altitude range of 114 to 241 kilometers (71 to 150 miles). 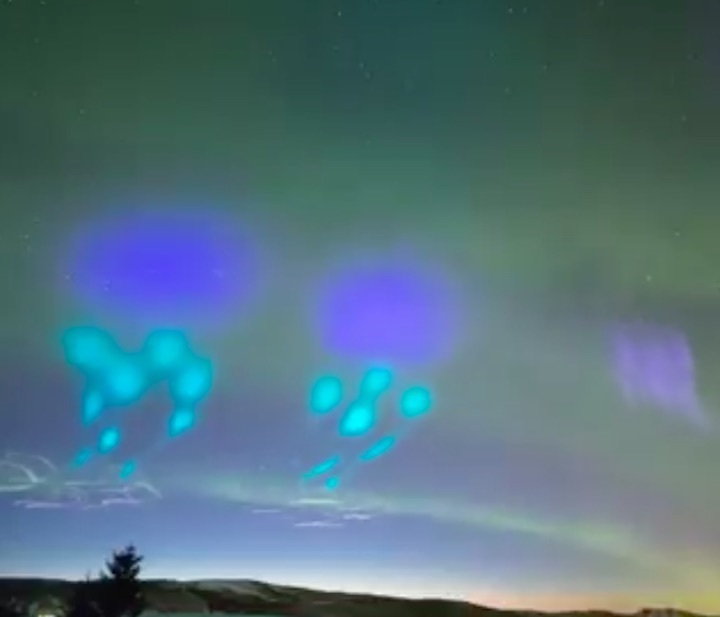 The colorful clouds created by the display allow researchers to track the vertical and horizontal flow of charged and neutral particles through the upper and lower ionosphere, the region where the solar wind interfaces with the atmosphere. Engineers prepare AZURE for launch. 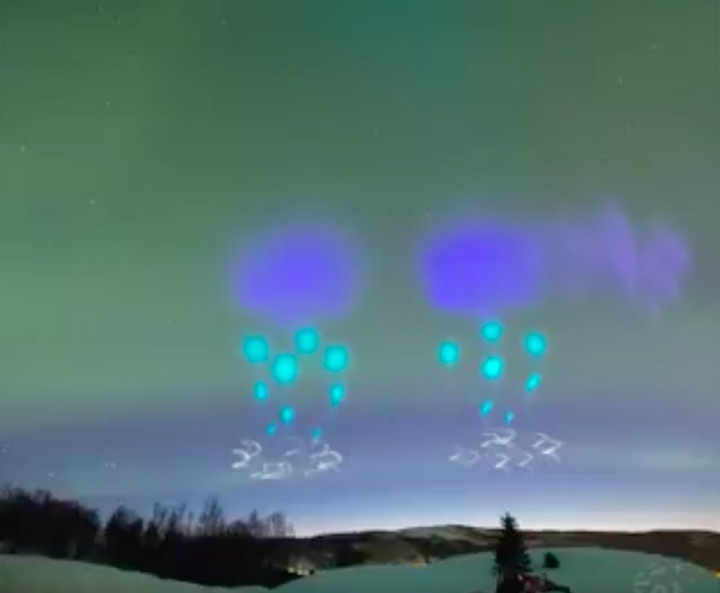 AZURE is part of the Grand Challenge Initiative, one of nine missions studying the interaction between the solar wind and Earth's atmosphere in a high Arctic region known as the auroral cusp. 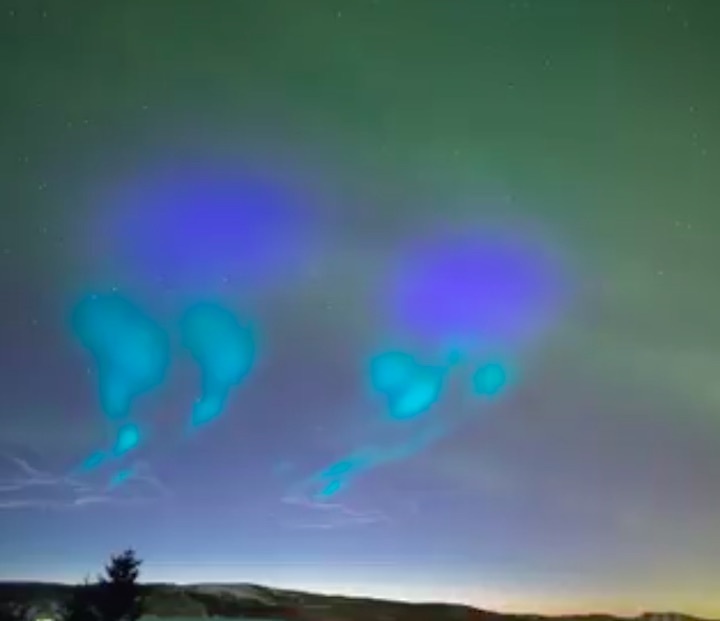 One key mystery scientists want to address with AZURE is just how auroral energy from above might trickle down and influence the atmosphere below. Earth's magnetosphere to scale, showing the "funnels" of the auroral cusps near the poles. Typically, aurorae are enhanced and active near both equinoxes. The solar wind streams through fissures known as "equinox cracks," when the prevailing south-pointing field of the solar wind forms a connection with Earth's north-pointing magnetic field. 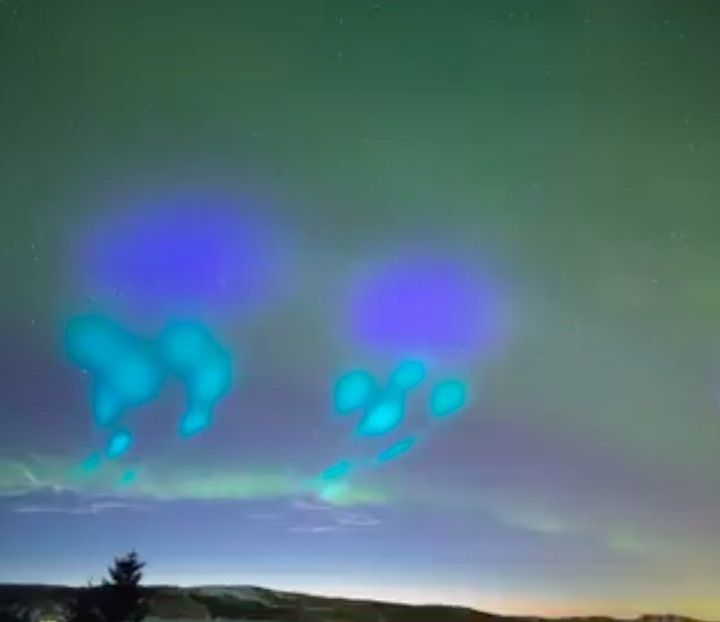 NASA's artificial display also treated observers and photographers to an unearthly spectacle that looked like fluorescent jellyfish shooting glowing green orbs groundward. The videos and stills captured from the event look like H.G. Well's towering Martians from War of the Worlds, back for a rematch. You can just imagine the surprise, if such a display were to be carried out over a populated area such as Los Angeles! Suborbital rocket launches that spawned amazing sky sights have surprised the unwary before. For example, the "Ghost Rockets" of 1946, seen over Finland and Sweden, were thought to be Soviet tests of captured German V2 rockets. More recently, many observers captured an equally amazing spiral seen over Norway in 2009, which was the result of a failed Russian Bulava missile launch from the White Sea. The June 29, 2017 launch and chemical tracer release from Wallops. Aurora and atmospheric tests are also occasionally carried out from the Poker Flats Range in Alaska and NASA's Wallops Flight Facility along the Virginia coast. Astrophotographer Christopher Becke caught the amazing launch featuring a similar chemical tracer release from Wallops, which deployed similar sky tracers early on the morning of June 29, 2017. 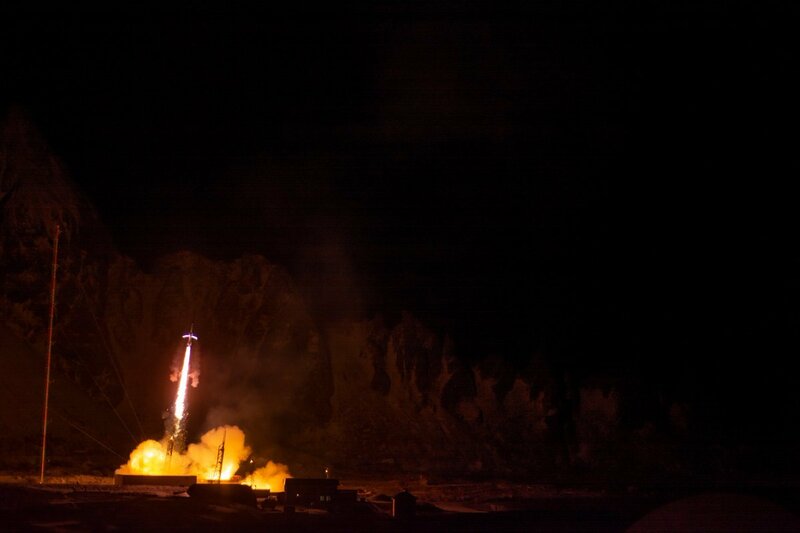 AZURE may be the last launch of the season from Andøya as the long Arctic night comes to an end, but it isn't the last of the Grand Challenge Initiative. Watch for the launch of ICI-5 from Svalbard in December 2019, which looks to study GPS "hot patches" in the ionosphere, and C-REX 2, launching from Andøya in November 2019. C-REX 2 will characterize density increases in the auroral cusp. These increases can act like "potholes" to satellites passing by, often perturbing their orbits. Looking further ahead, the Japanese Space Exploration Agency's (JAXA) SS-520-3 mission will fly from Svalbard in January 2020, characterizing the escape mechanisms for upper atmospheric ions. Keep watching the skies . . . you just never know what sorts of bizarre sights may turn up.